Portrait of a bad dream: After years of dashed hopes, your greatest desire suddenly comes true. You are awarded a great honor, win the lottery jackpot, whatever. Now a thousand of your closest friends as well as VIPs (whom you’ve always hoped to meet!) are on the way to your house. Except your place is a mess, you don’t have enough food or drinks and everyone will have to hike in from a mile away because of work being done on the streets. That pretty well sums up Santa Rosa’s nightmare that came true on New Year’s Eve, 1870. By that time, Santa Rosa had been yearning for a rail connection to the Bay Area for over five years. Several times it looked like a deal was a Sure Thing, only to have investors pull out or the developer lose interest. Some of those involved were interesting characters with wildly ambitious proposals (building a suspension bridge across the Golden Gate in 1868!) but that’s a complex story too long for today. Besides, I couldn’t tell the story any better than what’s found in “Redwood Railways” by Gilbert Kneiss – the county library has several copies available for borrowing. HOW WE GOT TO SAN FRANCISCO BEFORE THE TRAINBefore 1871 it usually took three or four days to make a quick roundtrip between Santa Rosa and the city. First there was the bone-rattling stagecoach to Petaluma over uncertain roads – see the transcribed articles below for complaints about the “horrible adobe flats between this place and Petaluma” where passengers sometimes had to get out and push during the rainy season when the wheels stuck in the mud. Then there was the 2½ mile trip from downtown Petaluma to the dock at Haystack Landing on a little trolley whose “speed resembles more the limpings of an old lame horse.” Or at least that was the scene up to August, 1866, when the train’s boiler exploded and killed four – after that, the trolley was even slower, pulled by actual horses. Petaluma also infuriated “up-country” travelers because steamboat schedules didn’t mesh with the stagecoach/trolley, so they usually needed to stay overnight at a Petaluma hotel. That trip down the Petaluma River ended at the Point San Quentin wharf, where passengers boarded a ferry which would make several stops in Contra Costa before (finally!) heading to San Francisco. For purposes here, only two bits of background are important: First, the guy who finally made it happen wasn’t a banker or empire-building tycoon, but rather a San Francisco foundry owner named Peter Donahue. It didn’t hurt that his iron works made locomotives and ships. Also, there were years of heated debate on what route the train should take from the Bay to Santa Rosa and points north. Santa Rosa pushed hard for the train to go through the town of Sonoma and terminate in Vallejo, where there were grain elevators to store Sonoma county wheat. The alternative was a straight shot north/south similar to modern Highway 101, where a ferry at “Saucelito” could take passengers into San Francisco. The route through Vallejo would not connect to Petaluma, so their town would probably wither away. There was a county vote on this in 1868 and the straight shot won. 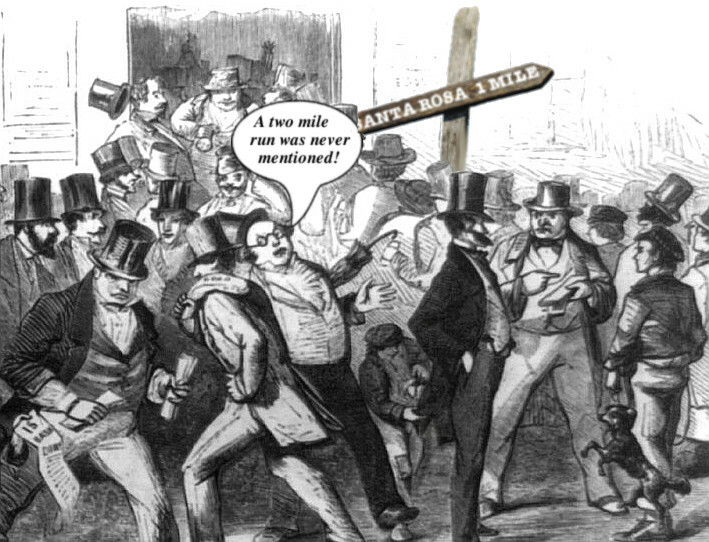 A popular conspiracy theory spread that Petaluma – whose high turnout of voters in the 1868 referendum settled the route question – was working behind the scenes to scuttle the railroad (or at least drag out construction as long as possible). “Cracker barrel gossip agreed the ‘earth scratching’ was just a vaccination to ward off a railroad,” author Kneiss remarked. Petaluma’s motive was supposedly to protect its monopoly on San Francisco travel via paddlewheel steamers. Then suddenly, in August, 1870: “THE RAILROAD IS COMING! HURRAH FOR THE RAILROAD!” cheered Santa Rosa’s newspaper, the Sonoma Democrat. Voters had approved a $5,000/mile bounty for the first company to lay ten miles of Sonoma county track, and that month Peter Donahue bought the San Francisco & Northern Pacific from the developer who had made such little progress. Donahue’s operation hit the ground running with a crew of fifty Irish immigrants grading the road while schooners – with railroad ties and iron rails from his own foundry – were queued up to unload at Petaluma’s wharf. Crowded as they were, room was still made for a ten gallon keg of Edwards’ Cream Ale before the little engine went tootling down the track, stopping a couple of miles from town at Cinnabar Knoll where they polished off the keg with tributes and toasts to all involved. Before another month passed the rail would be closing on Santa Rosa which was now suddenly a cause for worry – there were no firm plans about where the depot should be built. There were rumors that Donahue was planning to put it somewhere south of Santa Rosa Creek, or was negotiating with property owners to put it between the Creek and Third street. They didn’t settle on the final (current) location until just before Thanksgiving. Sans depot and with not even a railroad bridge across the Creek, the first passenger train came up from Petaluma on October 22, 1870. “To many, it was a novel sight, as they had never seen one before,” gushed the Democrat, “and they could scarcely find words to express their admiration.” A week later they began running two trips daily, although the rail south of Petaluma – to the depot town named “Donahue” – was still under construction. And then came the fiasco of December 31. WHERE WAS DONAHUE?From 1871 to 1884, the tiny hamlet of Donahue was the gateway to Sonoma county. About eight miles south of Petaluma on Lakeville Highway (there’s a historic marker by a turnoff on the west side) was the Petaluma River landing where paddlewheel steamers from San Francisco docked. From there, passengers boarded a train for Petaluma or Santa Rosa, with the SF&NP railroad in those years eventually reaching Cloverdale. Local produce was also usually aboard on the return trip to the city. A memoir by Mrs. Julia Gregory in the Petaluma Argus-Courier August 17, 1955, recalled Donahue as “a little town of 10 homes, a hotel, a saloon run by a man named Burdick, a stable and dance hall combined.” There was also a one-room schoolhouse with 30-40 children and two laundries. Mainly, though, it was there to offer a train depot as well as the railroad’s repair shops, roundhouse and turntable. Donahue Landing, as it’s called today, mostly disappeared in 1884 when the southern terminus of the rail line was moved to Tiburon, with the railroad buildings dismantled and barged down to their new location. The Donahue river depot was now finished and ready to receive the first batch of visitors arriving directly from the city. And thus on the last day of the year, a steamer owned by the railroad left the Jackson Street Wharf, “loaded with passengers, among whom were some of the most noted and substantial men of the state,” according to the Argus. Once aboard the train, they made the short hop to Petaluma, where “an immense concourse of people had gathered at the depot.” The tourists were greeted by the Hewston Guard (yes, that’s the correct spelling) and the Petaluma Brass Band. The cannon in the plaza was fired as well as rounds fired by the militia. It was a grand reception – but now on to Santa Rosa! So picture this: It’s early afternoon and a “large throng of ladies and gentlemen” as well as the Santa Rosa Brass Band are waiting for the train to arrive. Until train service began a couple of months before some had never seen a train at all and since then, only an engine with a single passenger car and maybe a flat car. And now, here comes the excursion from San Francisco. “There were, in all, eighteen cars, most of them open freight cars fitted up with temporary seats,” reported the Democrat. Over 1,200 people were on board. And now the nightmare begins: The train got no closer than a mile from Santa Rosa – think of today’s Costco shopping center, or perhaps more accurately, the Baker avenue/101 interchange. Making matters worse, the train would be going back in an hour. Worse still, there were only a few buggies and wagons waiting to transport the mob into town. Those who wanted to see Santa Rosa would have to run for it. Owing to the great number of those present, it was utterly impossible to find vehicles enough to bring them all to town, and many of both sexes were compelled to walk in, a distance of nearly a mile. This was not very pleasant to begin with, particularly as but one hour was allowed to get to town and return in time for the homeward trip. Such a pushing, rushing and scampering down the road and across lots, has not been seen for many a day in these parts. In a short time Santa Rosa was full of people, nearly all of whom had arrived with appetites sharpened by fasting from the time of leaving the city, some six hours before. Again came disappointment, as it was utterly impossible to wine and dine such a multitude without preparation and within the brief space allowed for their stay. Back everyone went to Petaluma (“the down trip was remarkably jolly, under the circumstances” – Democrat) where they recovered from their Santa Rosa rout for an hour, then returned home to San Francisco on the boat where they enjoyed a banquet catered by Hendrick’s Hotel in Petaluma. Santa Rosa probably could not have made a worst impression, nor Petaluma a better one. Looking over all that happened, you almost wonder if Santa Rosa had been punked by Petaluma and Donahue – revenge, perhaps, for pressuring the county to choose the route to Vallejo instead of the one that favored them. Petaluma railroad affairs seem to have gotten into a muddle. Col. Bee, the Superintendent, and all hands, were discharged last week, and work consequently suspended. We are assured, however, that it will be resumed at an early day, though the prospect is not very flattering. Under the bill, if we recollect right, the Company is compelled to have ten miles north of Petaluma graded, ironed and in running order by November next. We need not disguise the fact that many of our citizens do not believe good faith is being shown in this matter. Since the vote we have endeavored to show that it would certainly be built inside the unspecified time, and regret exceedingly the manner in which affairs have been managed. It appears from a correspondence to the Healdsburg Flag that this question excites the belligerent organa of the people of Sonoma county. If a stranger goes into that county and asks “How is your railroad?” the chances are that he will be knocked down or sadly abused. The truth of the matter is, that the people have been humbugged, and kept out of a railroad till they are far in the rear of the State in the march of improvement. The citizens of Petaluma have always had an idea that a railroad would be injurious to their interests, aud have fought manfully against the construction of one. They did this openly until they saw it was of no use to do so any longer. They then pretended to favor it, and a company was formed, the citizens of Petaluma becoming large shareholders, and thus prepared, they elected the principal officers, to have the management in their hands, and they then let the whole matter go by default. A bill was passed by the last Legislature authorizing the county to donate five thousand dollars per mile towards the construction of the road, provided the people of the county would vote in favor of it. An election was held to decide the matter. By a very clever maneuvre on the part of Petaluma, it was incorporated so that the people should at the same time decide whether the road should be built from Vallejo via Sonoma to Santa Rosa or from Petaluma to Santa Rosa. A spirited canvass was made—the subsidy granted—the Petaluma route gained the victory. It was placed in the hands of a company, that, it is now seen, never intended to build the road and Petaluma is again victorious. Provision was made in the bill that ten miles of the road should be built in a certain time, or the subsidy be forfeited. That time has now about expired, and not a mile of the road is built. Thus a small portion of the people appear to hold the destinies of the balance of the county in their hands. The people, seeing that they are to have no railroad, and have been cheated out of the great advantages they had had a right to expect, feel very sore whenever asked “how is your railroad?” Sacramento Reporter, Nov, 2. The Railroad Is Coming! Hurrah for the Railroad! This is the exclamation of everybody in this section of the county who favors this most important enterprise. There has been a feeling of doubt existing in the minds of even those who were the most confident that the road would be built, that by some hook or crook the managers of the new company would get into a wrangle over the matter, among themselves, and thereby cause great delay in the completion of the road. But it is gratifying to know that these fears have all been dispelled, and that the people are now confident that the company intend to commence work immediately and push on as rapidly as possible. We are informed by a gentleman who is one of the most prominent business men in Petaluma, that several large schooners have arrived at that place within the past week, loaded with ties for the Sonoma county Railroad. He also stated that it was his impression that a force of some fifty men were now at work on the grade, and that in a few weeks the company would have some two hundred men at work on the line. This looks like business, and it is now a settled fact that Sonoma will soon be linked to the Metropolis by iron bands, and the shrill whistle of the iron horse will ring through her beautiful valleys. With the railroad Sonoma will take the lead ol all other counties in the State, for her soil cannot be excelled. Railroad Matters.— Since the arrival of a portion of the rail at Petaluma, which are to be used in the construction of the Sonoma County Railroad, things generally in this vicinity have began to brighten up, and we bear no more complaints as to the possibility of our county being compelled to remain in the back ground for the want of this great enterprise. The movements of those who are managing the interest of the company within the past two or three weeks, have completely allayed the fears of even the most skeptical. It is no longer a question of doubt. The iron has arrived and workmen are now engaged on the road. Those who are in a situation to be well posted on the matter, feel perfectly confident that within three months time Santa Rosa will be connected with the Bay by rail. Instead of a man being compelled to take three or four days to go to the Metropolis and transact his business and return home, he can then make the trip in a few hours by a much more pleasant mode of conveyance than the slow and lumbering stage coach. Our citizens are rejoiced that their labors on behalf of this enterprise are now about to be crowned with success. They have waited long and patiently for it, feeling a consciousness that it would rebound to the benefit and prosperity of every section of the county, and when the shrill whistle of the Iron horse announces the approach of the cars, our people will send up a good hearty cheer as they bid goodbye to the horrible adobe flats between this place and Petaluma. It is Coming —The work on the railroad is being pushed on with vigor. The tents of one of the camps is now five miles this side of Petaluma. A portion of the track has been laid, and a construction car is running. So far all the work has been done bv white men, and it is the intention, we are told, to employ no slavish Chinese labor in the completion of this enterprise the people of our county will award Mr. Donahue the praise that he is deserving of, for employing white men to work on the road instead of Chinese slaves, who contaminate everything they come in contact with. The Railroad.— Work is being pushed ahead as rapidly as possible on the road, and it is thought by some that it will be completed to this point by the last of October. During the past week Mr. Donahue and a number of other gentlemen connected with this enterprise paid our town a visit. As yet it is impossible to tell where the depot will be, although it is rumored that the company have purchased land on the other side of the creek for depot purposes. The Depot.— Now that the railroad is nearly within our town limits, much speculation is going on as to where the depot will be located. It was rumored here some weeks ago, that arrangements of a satisfactory character had been completed between Mr. Donahue and Messrs. Boyce and Clark, for the purchase of eight acres of land lying near the creek at the foot of Third street. This, however, turns out not to be the case, as do final arrangements were ever completed between the above named parties. There is a petition being circulated now, and signed by the property owners ot the town, for the purpose of having all the property taxed proportionally, and the sum so realized to go towards the buying of the land we here named, whereon the depot will be located. The chances are favorable for the location to be on the Boyce and Clark property. The first passenger car, bearing the name of “Donahue,” arrived at this place crowded with passengers on Saturday last. Considerable rejoicing was manifested by our people over its arrival, and in the afternoon large numbers went to the terminus of the road, about a mile from town to get a sight of the first railroad car that ever made its appearance near Santa Rosa. To many, it was a novel sight, as they had never seen one before, and they could scarcely find words to express their admiration. All seemed fully conscious of its great advantages over the slow, lumbering stage, and were anxious to experience the delightful sensation of ”riding on a rail.” In the afternoon an excursion party, composed of the prominent citizens of our town, in conjunction with a number from the lower end of the county, went over the road on a pleasure trip to Petaluma. Being in charge of Captain Wright, the genial and affable Superintendent of the road, it was impossible for them to have anything less than a jolly good time. The locker was supplied with any amount of champagne, cigars, etc., and many a toast was drank to the health of Mr. Donahue and the rest of the gentlemen connected with the road. Capt, Wright is finishing up the work on the road between this place and Petaluma as rapidly as possible. On Sunday last we had the pleasure of making a trip with him, during which he generously furnished us with all the information we desired. In consequence of the amount of carpenter work to be done on the road between Petaluma and Lakeville, it will be fully a month yet ere that portion of the work will be finished. Until it is completed they will continue to run the one passenger car, in addition to an open car which can be used by those desirous of being out in the open air. The trip will be made regular each day, leaving Petaluma at eight o’clock in the morning, and returning from here at four o’clock in the afternoon. The fare will be one dollar each way. So far the track reflects great credit upon those who have had the management of its construction, and it will bear comparison with any in the State. The time consumed generally in making the trip from here to Petaluma, sixteen miles including stoppages, is aboat forty-five minutes. When the heavy, powerful engines are in operation, it is thought that thirty minutes will be the time made. All on board enjoyed the trip greatly, and returned to town in the afternoon with glowing accounts of having to encounter neither dust nor adobe mud on the way. We desire to return our thanks to Capt. Wright, also, to Mr. Craig, the conductor, for favors shown on the trip. During the past week the large and powerful locomotive “San Jose” has been put on the route between this point and Petaluma. The cars are now making two trips daily, and connect with the boats for San Francisco. Messrs. Clark & Bostwick, representing the “Fashion” and “California” stables, run their stages daily to the termini of the road, and go crowded each trip. These gentlemen stand foremost among our enterprising citizens and deserve to meet with success. Work is being prosecuted vigorously on the track between Petaluma and Lakeville, and in a few more weeks the passenger trains will be on, and the people of Santa Rosa will be within three hours ride of San Francisco. This is certainly a glorious change for the better, and will be fully appreciated by our people, who have for years in the winter time been compelled to pay a high price for walking through adobe mud and dragging a lumbering old stage to Petaluma, taking at least one day and a half to reach the Bay city. The completion of the railroad has played sad havoc with the arrangements of those who formerly mapped out the course of travel, and now the people in this vicinity can visit the metropolis much cheaper and more comfortable, besides saving a great amount of valuable time. The Depot Question Settled.—The question which has been uppermost in the minds of our citizens (or the past month as to where the Railroad Company would permanently locate their depot, has at last been definitely settled to the satisfaction of all parties concerned. On last Saturday a meeting was held, and the vexed question brought to a termination. The company is to have seven acres ot land, situated half a mile from the Court House, and lying between Third and Fourth streets. This property formerly belonged to Messrs. Boyce and Clark, each of whom gave $100 toward its purchase for the use of the Railroad Company. The citizens of the town subscribe $300, and the Board of Trustees become responsible for the balance. The company have purchased the property of Henry A. Peabody, Esq., which adjoins that which has lately come into their possession. It is the opinion of Captain Wright that in thirty days the depot will be established on this side of the creek. A pile-driving machine will be brought up from the city in a few days, so that work can be commenced on bridging the creek. The value of the land to be used for depot purposes was estimated by the appraisers at $1,000. The place selected is the most advantageous one that presented itself, and will give universal satisfaction to our citizens. The cars are making their regular trips daily from this place to Petaluma, and considerable travel and freight are passing over the road. The travel through our county now, although much greater than what it was formerly, will be largely increased as soon as the road is completed and in running order to Lakeville. At present there is but one passenger car on the road, and in making a trip from Petaluma to this place on Monday last, we were convinced, from the crowded condition of the passengers, that they thought the accommodations entirely too limited. However, all were willing to adapt themselves to circumstances, feeling thankful for having escaped the jolting and adobe mud which they formerly had to encounter when traveling by stage. In a few days more the lower end of the road, which is being worked under the supervision and guidance of that clever gentleman, Captain Wright, the Superintendent, will be completed. The Captain has met with many arduous difficulties in constructing the portion of the work, but his energy has overcome them all, and shortly the snort of the iron horse, accompanied by his long train of handsome and highly finished cars, will be heard at Lakeville. At that place the beautiful and fast steamer Sacramento is now waiting to be called into service. She is a fast boat, and her accommodations for the comfort and convenience of passengers are unsurpassable. The trip from the city into the very heart of old Sonoma—with her delightful climate and fertile fields, will then indeed be one of pleasure and recreation. Hundreds will visit our county then, who, until the locomotive began to traverse our valleys, would never have visited our county. The officers of the road are, with no exceptions, noted for their affability and politeness. Captain Wright, the Superintendent, has made a host of warm friends, and they continue to increase daily. To take a trip on the cars with him is a sure guarantee of a day’s pleasure. Mr. Craig, the conductor, has also become very popular with the people. He is a clever and genial gentleman, and understands the duties of his position thoroughly. The officers are all clever gentlemen, and are always found, as they should be, courteous and polite in the discharge of their respective duties. two artlcles written by “Handy,” and published recently in the Crescent, in regard to dividing Sonoma County…There should not be any jealousy between our city and Santa Rosa. Petaluma only differed with Santa Rosa in claiming that the railroad must accommodate both towns, instead of passing directly from Santa Rosa to Vallejo. Petaluma has succeeded in getting it where she desired; both towns have the benefit of the road; we are within thirty minutes run of the county seat, and liberal minded men should be satisfied. Nature has given us the best point for trade, while the railroad will tend to equalize the advantages of the up-country towns, and bring them in competition with Petaluma. Santa Rosa is much nearer the centre of the county, and is, therefore, entitled to the Court House. We were in hopes that the railroad would so connect us that all ill feelings between our towns would be dispelled, and we regret to know that even “Handy” desires to disturb our harmony and dismember our grand old Democratic county. The Railroad —By the beginning of the new year the railroad will be completed and the cars running to Donahue, which will link us to the great cosmopolitan city of San Francisco, For years this has been the hope and desire of many of our enterprising citizens throughout the county. Various efforts were made by them to unite our fertile fields by bands of iron to this great commercial market but their labors signally failed through various causes. But at last the good work is accomplished, and the produce raised by the farmers of old Sonoma can now be transported speedily and cheaply to market. A new era has been opened in the history of our county, and its future is bright with promises of renewed life and activity. The Excursion on Saturday Last. Vague rumors were in circulation, during the early part of last week, that an excursion party from San Francisco was coming up to Santa Rosa on Saturday, at which time the first train would run through from Donahue to Santa Rosa. Nothing definite was known, however, and up to Thursday evening, on going to press, we were unable to say positively that there would be an excursion, but gave the report as it came to us. On Friday, however, one point was settled, namely, that some excursionists were coming at the time mentioned, but as to the number all were in the dark. LIGHT ON THE SUBJECT. The following day cleared up the mystery. A long train of cars came in sight of the depot, with over twelve hundred persons on board. There were, in all, eighteen cars, most of them open freight cars fitted up with temporary seats, and gaily decorated with flags and evergreens. Three bands of music, including the juveniles of the Industrial School, a bright set of little musicians, under the charge of Mr. Pelton, accompanied the party; also, two or three military companies from the city and Petaluma. THE ARRIVAL. The scene at the depot on the arrival of the party was a sight well worth seeing. A large throng of ladies and gentlemen from our town had gone out to welcome their visitors, attended by the Santa Rosa Brass Band, and the train was greeted with music, cheers and waving of hand kerchiefs, which was returned with interest by the immense crowd of excursionists. Owing to the great number of those present, it was utterly impossible to find vehicles enough to bring them all to town, and many of both sexes were compelled to walk in, a distance of nearly a mile. This was not very pleasant to begin with, particularly as but one hour was allowed to get to town and return in time for the homeward trip. Such a pushing, rushing and scampering down the road and across lots, has not been seen for many a day in these parts. IN TOWN. In a short time Santa Rosa was full of people, nearly all of whom had arrived with appetites sharpened by fasting from the time of leaving the city, some six hours before. Again came disappointment, as it was utterly impossible to wine and dine such a multitude without preparation and within the brief space allowed for their stay. In consequence of this the visit was neither pleasant to our citizens nor to the excursionists, who, by the way, were as jolly a crowd of good fellows and fair ladies as we have ever seen together, and after bustling about for a few minutes in a most disagreeable and unsatisfactory manner, a grand rush was made for the cars to take them home. MORE BLUNDERING. Here again came trouble. Many of the people of Santa Rosa desired to accompany their friends on the return trip as far as Donohue, but could net ascertain definitely, until the train was about to start, whether any provision had been made to bring them back, that night. In addition, invitations had been issued with a sparing hand. Consequently, only a small number from this place went down. On whose shoulders rests the blame for all the mistakes and blunders which characterized this excursion, we are not prepared to say, but there is enough of it to go round on all concerned. HOMEWARD BOUND. The down trip was remarkably jolly, under the circumstances. On reaching Petaluma the cars stopped one hour, giving all an opportunity for a brief visit to the metropolis of our county. At the expiration of that time the whistle sounded, and the train started for Donahue, which was reached in a very short time. At this new town the steamer “Sacramento” was lying alongside the company’s wharf, ready to carry the gay voyagers to the city. A splendid collation was spread on board the steamer, and the manner in which the good things disappeared showed that this was emphatically one of the substantial pleasures of the trip. On the way down the company had a glorious time, dancing and speech-making being, the order of the day. PERSONAL. Among the visitors to Santa Rosa on this occasion were Peter Donahue, President of the Railroad Company, Senator Wand, Assemblymen Griswold and Homer…and a boat of others, old friends and good citizens, whom we cannot now recall by name. Going to Work. —We are informed that work is to he commenced at once on the railroad bridge across Santa Rosa creek. Last Saturday was the occasion of a grand jubilee for Sonoma county. The long-hoped for railroad through her center was built, and the formal inauguration of the same gave an opportunity for a first-class “blow out.” Invitations were pretty generally issued by President Donahue for an excursion from San Francisco to Santa Rosa. Accordingly several from this city availed themselves of the opportunity and went to San Francisco in order to make the first through trip. The Company’s steamer Sacramento left Jackson Street Wharf, San Francisco, about eight and a half o’clock, loaded with passengers, among whom were some of the most noted and substantial men of the state. Two fine bands of music accompanied the excursion, as also the California Guard and Capt. Bluxome, with his celebrated battery, which did lusty service in firing salutes at different points along the route. Our citizens knowing that the train was expected here about eleven, kept a sharp look-out across the valley for the train, and all good observatory points contained more or less of humanity, eagerly watching to see the iron horse come up the track. Owing, however, to some detention, it did not arrive until after twelve, and was several minutes behind the time of the steamer Petaluma, whose passengers arrived in this city some minutes ahead. In the meantime an immense concourse of people had gathered at the depot in East Petaluma. Maj. Armstrong, with the Hewston Guard, headed by the Petaluma Brass Band, turned out to welcome the excursionists, and receive their brothers in arms. As the long train, consisting of three passenger and twelve platform cars, came in sight, the cannon from the Plaza fired a salute, and was soon replied to by Bluxome’s Battery. After stopping about three-quarters of an hour, on order to take aboard the excursionists from this city, the train proceeded on its way. The day was surpassingly pleasant, and every one looked happy and seemed to enjoy the run up, which was made in fifty minutes. The beautiful appearance of our valley, that in passing farm houses, residences, or even single individuals, the enthusiasm would find vent in prolonged cheers, while ladies handkerchiefs waved in profusion. 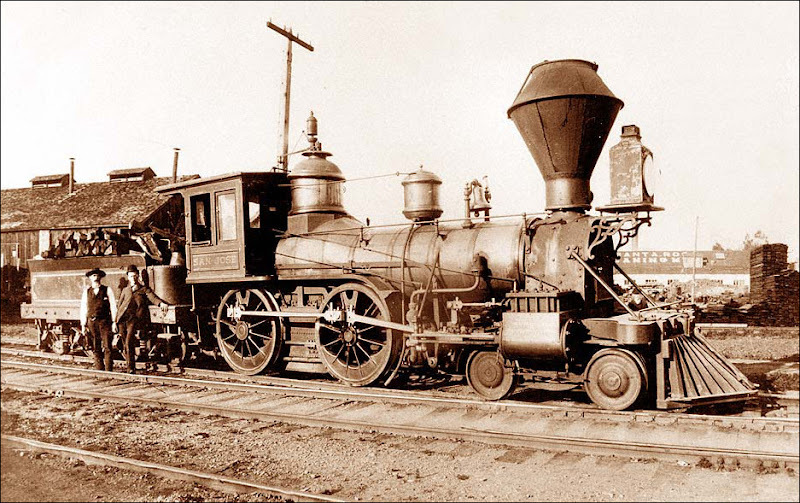 At Santa Rosa the train was met by a brass band, and many citizens in carriages and wagons, while anvils were improvised for cannon, and kept hot with echoing salutes. The people at the County Seat must certainly have fancied they were taken, as the immense numbers poured into the town, filling the streets with a life and bustle, rarely witnessed on Montgomery or Main. The excursionists passed the hour allotted to them there, by wandering around the town, admiring its locality and the many pretty and cosy residences that are observable on every hand. More particularly did the San Franciscans admire and even go into raptures over the climate, whose mildness was such a pleasant and agreeable transit from the bitter winds and cold fogs of the Bay City. Opening of the San Francisco and North Pacific Railroad.